Vermilion River flows from Lake Vermilion to Crane Lake. Vermilion River is a State Water Trail, and is 40 miles from Lake Vermilion to Crane Lake. There are several portages on the river some are longer than others. Vermilion Cabins for Sale and all other properties in the area. A dense forest of pine, spruce, fir, aspen and birch covers the watershed. Cliffs and other exposures of bedrock often flank the Vermilion River. Bluffs occasionally rise more than 100 feet above the river. A few Resorts and cabins at Vermillion and Crane lakes and the town of Buyck are the most significant areas of development near the river. Two bridges and a few cabins are along the river, farms are scattered along the rest of the stream. Most of the Vermilion River appears wild. The bedrock of the Vermilion watershed consists of a variety of lower Precambrian igneous and metamorphic rocks, including biotite schist and granite. Glacial drift is thin. Outcrops are common. Smallmouth bass, walleyes, northern pike and rock bass are common. Muskies and crappies have been reported. The MN Dnr conducted a fish survey in the Chain of Lakes area of the Vermilion River. The “Chain of Lakes” section of the Vermilion River is located 16 miles east of Orr, MN and is approximately 1,071 acres. Generally fish abundances were near or lower than levels found in similar lakes. However, length and weight are generally above average and growth is good for most species. There were a fair number of black Crappie and they were of good size. 8.5 to 11.9 inches. Bluegill were in average abundance for this type of lake. Northern were average for this type of lake and were sampled up to 37.4 inches. Walleye and bas were caught and walleye up to 23 inches were sampled. Wildlife can be seen along the Vermilion River. Often eagles, bear, deer, wolves and osprey are sighted. 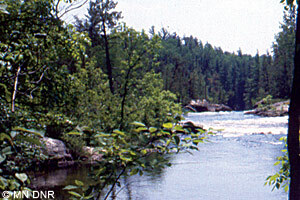 The Vermilion River was a main trade route for the voyageurs. RE/MAX Lake Country can help you find the perfect recreation property. Maybe you want a hunting property or a place to park your camper and have a base camp for all the outdoor recreation the area offers. many year round homes and cabins are along the river giving you many options. Many people will snowmobile on the river watching for the winter portages. The snowmobile trail runs near the Vermilion River at several places. Imagine playing in the snow all day and coming back to your cabin in the evening and relaxing around the fire. No matter what you are looking for in the Buyck, Crane Lake and Lake Vermilion area RE/MAX Lake Country will find you the perfect cabin or home.